Yacht trip around Langebaan Lagoon. Sailing, yachting, cruising, extreme sailing, hobie sailing all on Langebaan Lagoon. Hobie Cat – Adrenaline sailing at its best! Hobie Cat trips and charters include a qualified skipper and we offer flexible sailing programs from one hour up to a few days. We are also Hobie Cat agents. 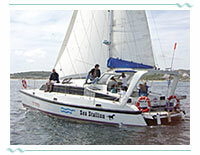 For a cruise in the magnificent Saldanha Bay or the scenic Langebaan lagoon. Take a trip to any of the five off-shore islands , or enjoy a sundowner on board while watching a spectacular sunset over the Atlantic Ocean. Lunch cruise – a four hour trip including lunch at a waterfront restaurant in Saldanha Bay. Lagoon cruise – duration about two to three hours. For an additional fee a picnic basket can be arranged to be enjoyed on board. Island cruise – a two hour trip to view the penguins, Cape gannets, cormorants and other seabirds on the off-shore islands. And the wildflowers in spring, of course! Drinks and snacks provided on board. Fishing trips in the lagoon or out in the open ocean. Speedboat and/or inflatable boat trips, can be combined with water-skiing if required.